YOUNG + Fabulous: Quoï Alexander SS18 is fresh fashion with a twist. Exploring fashion without traditional sewing -neither by hand or machine. This season, the young designer features silicon elastomer bonded with cotton tulle, canvas and leather which is then punctured with metal to create a non-stiched “seamless” construction. Cute paper hand drawings are laminated and fixed to the garments as prints, in them conveying the abstract sources and seemingly random compositions which inspired the collection. Accessories of shoes and bags are made of leather, rubber and pony skin and are eyeleted together to form small architectural pieces with a focus on closures and finishings. 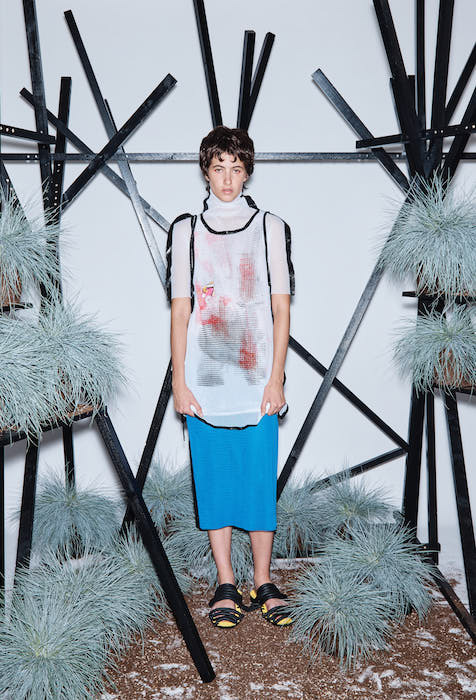 about the designer: a Paris-based interdisciplinary fashion designer originally from California, USA where he studied Fine Arts at Idyllwild Arts Academy. Continuing his education in the arts he moved to London to study Fashion Design Womenswear at Central Saint Martins. Quoï gained experience at Alexander McQueen, Sonia Rykiel and Chanel before starting his own brand, “Quoï Alexander” which Francesca Burns, Fashion editor of Vogue UK, describes as “Innovative craftsmanship well executed in a fresh and modern way”. Young fashion: Quoï Alexander SS18 Paris commentary by Brigitte Segura.